Olioboard and Hayneedle.com have partnered up to help you with your holiday shopping this season. We’re running a contest where entrants can create their very own holiday wish lists that they can save, shop and share. Now here’s the exciting part. 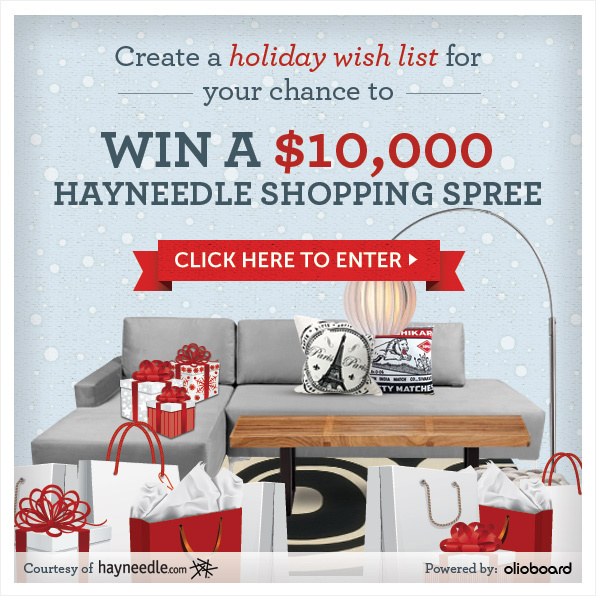 Everytime a board is voted on or shared on facebook, twitter or by email, we add an extra ballot for that board to the grand prize draw of a $10,000 HAYNEEDLE.COM SHOPPING SPREE! Head over to imdreamingof.hayneedle.com to create your wish list now and don’t forget to vote and share daily to increase your chances of winning $10,000. While you’re at it don’t forget to send your personal holiday wish lists to family members and friends to let them know what you want this season. Anyone who receives your wishlist will be able to shop directly from it. Better yet, tell your family members and friends to create their own holiday wish lists and send them to you so you know what they are hoping for. If you dread the shopping malls as much as I do this time of year, grab a soft sofa, a cup of hot chocolate, your laptop and get that shopping done with a click of your finger. You’ll have peace of mind knowing that you got the right gift for someone this year with none of the hassle. Above all else, have fun this season, spend time with family and friends and don’t let the scrooges get you down!